The roles of women during the Korean War (1950—1953). Not only were women indiscriminate victims of offensives and counteroffen-sives, they were also active participants in the war effort. Women from all sides of the conflict filled essential noncombat support roles, from nurses and caregivers to supply clerks and corpsmen as well as communication technicians and intelligence analysts, to help alleviate labor shortages. South Korean women were not only refugees during the Korean War, they were also active participants in the South Korean war effort. Korean women served in a variety of capacities and filled medical support occupations, such as surgeons, nurses, and dentists, that were in short supply due to the need for active duty troops. In the U.N. forces under U.S. military command, women from the United States, Australia, Canada, and Britain played a variety of subordinate roles: from logistical and administrative posts to nurses and healthcare providers in hospitals and Mobile Army Surgical Hospital (MASH) units. In contrast with their southern counterparts, women in North Korea were fully integrated in the military, serving in guerrilla units alongside their male counterparts as well as serving in military support roles. 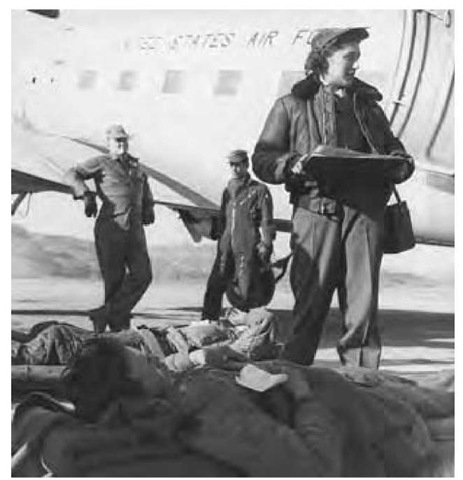 An American military nurse stands over wounded soldiers before directing the medical service technicians to load the soldiers on the military medical aircraft, 1953. Freed from the constraints of the Yi Dynasty and Japanese occupation, women in South Korea had made gains in education and were increasingly entering the workforce. The 1948 constitution had given women equality with men. The onset of the Korean War changed the status of women in South Korea. Not only did women who were trained at the Republic of Korea’s army medical field school serve in the Republic of Korea Women’s Army Corp (ROKWAC) as surgeons, nurses, and dentists, they were employed by war industries. As the need for servicewomen increased, more and more Korean women enlisted, and some trained to serve as officers in the ROKWAC. Recruits were given basic military training and then assigned to units as needed. As the war continued, women were given specialized training and were attached to specialized units. The greatest need for non-Korean service-women in Korea during the war was for nurses. Between 500 and 600 female U.S. Army Nurse Corp personnel served in the war zone supporting troops during combat operations. In addition, several thousand women worked in hospitals in the Far East Command during the Korean War. By the end of the war, over 120,000 women were on active duty serving as administrative aids, stenographers, and translators to release male soldiers for combat duty. There were also women from other countries—Australia, Belgium, Canada, Denmark, France, Great Britain, Greece, Italy, the Netherlands, Norway, Sweden, Thailand, and Turkey—who served during the Korean War. Like their American counterparts, a majority of these women served as nurses in hospitals. Women in North Korea were on a different footing than their southern counterparts. Following the consolidation of his control, Premier Kim Il Sung (president after 1972) promoted gender equality through the incorporation of equal rights in the North Korean constitution. North Korean women became members of the Worker-and-Peasant Red Guard or joined political organizations for women. By the beginning of the Korean War women were integrated into the ranks of the North Korean military. Women aided in transporting supplies to the front as well as other logistical tasks. Female soldiers served not only in traditional support roles but as frontline troops alongside their male counterparts. North Korean women frequently posed as refugees to infiltrate enemy lines to gather intelligence or to inflict casualties on unsuspecting U.N. forces. In addition, women fought with guerrilla units in the South, engaging in hit-and-run operations as well as sabotage.